Following the dissolution of the Soviet Union, Russian foreign policy is seen as being born from the conflict between three rival schools: Atlanticists, seeking a closer relationship with the United States and the Western World in general; Imperialists, seeking a recovery of the semi-hegemonic status lost during the previous decade; and Neo-Slavophiles, promoting the isolation of Russia within its own cultural sphere. While Atlanticism is the dominant ideology during the first years of the new Russian Federation, under Andrei Kozyrev, it will come under attack for its failure to defend Russian preeminence in the former USSR. The promotion of Yevgeny Primakov to Minister of Foreign Affairs will mark the beginning of a more nationalistic approach to foreign policy. Vladimir Putin's presidency lasted from January 2000 until May 2008 and again from 2012. In international affairs, Putin made increasingly critical public statements regarding the foreign policy of the United States and other Western countries. In February 2007, at the annual Munich Conference on Security Policy, he criticised what he called the United States' monopolistic dominance in global relations, and pointed out that the United States displayed an "almost uncontained hyper use of force in international relations". He said the result of it is that "no one feels safe! Because no one can feel that international law is like a stone wall that will protect them. Of course such a policy stimulates an arms race.". Putin proposed certain initiatives such as establishing international centres for the enrichment of uranium and prevention of deploying weapons in outer space. In a January 2007 interview Putin said Russia is in favour of a democratic multipolar world and of strengthening the system of international law. While Putin is often characterised as an autocrat by the Western media and some politicians, his relationship with former U.S. President George W. Bush, former Brazilian President Luis Inacio Lula da Silva, former Venezuelan President Hugo Chávez, former German Chancellor Gerhard Schröder, former French President Jacques Chirac, and former Italian Prime Minister Silvio Berlusconi are reported to be personally friendly. Putin's relationship with Germany's new Chancellor, Angela Merkel, is reported to be "cooler" and "more business-like" than his partnership with Gerhard Schröder, who accepted a job with a Russian-led consortium after vacating office. In the wake of the 11 September attacks on the United States, he agreed to the establishment of coalition military bases in Central Asia before and during the US-led invasion of Afghanistan. Russian nationalists objected to the establishment of any US military presence on the territory of the former Soviet Union, and had expected Putin to keep the US out of the Central Asian republics, or at the very least extract a commitment from Washington to withdraw from these bases as soon as the immediate military necessity had passed. During the Iraq disarmament crisis 2002–2003, Putin opposed Washington's move to invade Iraq without the benefit of a United Nations Security Council resolution explicitly authorizing the use of military force. After the official end of the war was announced, American president George W. Bush asked the United Nations to lift sanctions on Iraq. Putin supported lifting of the sanctions in due course, arguing that the UN commission first be given a chance to complete its work on the search for weapons of mass destruction in Iraq. Vladimir Putin with former Italian Prime Minister Silvio Berlusconi, 2008. The Commonwealth of Independent States (CIS), seen in Moscow as its traditional sphere of influence, became one of the foreign policy priorities under Putin, as the EU and NATO have grown to encompass much of Central Europe and, more recently, the Baltic states. During the 2004 Ukrainian presidential election, Putin twice visited Ukraine before the election to show his support for Ukrainian Prime Minister Viktor Yanukovych, who was widely seen as a pro-Kremlin candidate, and he congratulated him on his anticipated victory before the official election returns had been in. Putin's personal support for Yanukovych was criticized as unwarranted interference in the affairs of a sovereign state (See also The Orange revolution). Crises also developed in Russia's relations with Georgia and Moldova, both former Soviet republics accusing Moscow of supporting separatist entities in their territories. Russia's relations with the Baltic states also remain tense. In 2007, Russo-Estonian relations deteriorated further as a result of the Bronze Soldier controversy. Putin took an active personal part in promoting the Act of Canonical Communion with the Moscow Patriarchate signed 17 May 2007 that restored relations between the Moscow-based Russian Orthodox Church and Russian Orthodox Church outside Russia after the 80-year schism. In his annual address to the Federal Assembly on 26 April 2007, Putin announced plans to declare a moratorium on the observance of the Treaty on Conventional Armed Forces in Europe by Russia until all NATO members ratified it and started observing its provisions, as Russia had been doing on a unilateral basis. Putin argues that as new NATO members have not even signed the treaty so far, an imbalance in the presence of NATO and Russian armed forces in Europe creates a real threat and an unpredictable situation for Russia. NATO members said they would refuse to ratify the treaty until Russia complied with its 1999 commitments made in Istanbul whereby Russia should remove troops and military equipment from Moldova and Georgia. Russian Foreign Minister Sergey Lavrov was quoted as saying in response that "Russia has long since fulfilled all its Istanbul obligations relevant to CFE". Russia has suspended its participation in the CFE as of midnight Moscow time on 11 December 2007. On 12 December 2007, the United States officially said it "deeply regretted the Russian Federation's decision to 'suspend' implementation of its obligations under the Treaty on Conventional Armed Forces in Europe (CFE)." State Department spokesman Sean McCormack, in a written statement, added that "Russia's conventional forces are the largest on the European continent, and its unilateral action damages this successful arms control regime." NATO's primary concern arising from Russia's suspension is that Moscow could now accelerate its military presence in the Northern Caucasus. The months following Putin's Munich speech were marked by tension and a surge in rhetoric on both sides of the Atlantic. So, Vladimir Putin said at the anniversary of the Victory Day, "these threats are not becoming fewer but are only transforming and changing their appearance. These new threats, just as under the Third Reich, show the same contempt for human life and the same aspiration to establish an exclusive dictate over the world." This was interpreted by some Russian and Western commentators as comparing the U.S. to Nazi Germany. On the eve of the 33rd Summit of the G8 in Heiligendamm, American journalist Anne Applebaum, who is married to a Polish politician, wrote that "Whether by waging cyberwarfare on Estonia, threatening the gas supplies of Lithuania, or boycotting Georgian wine and Polish meat, he [Putin] has, over the past few years, made it clear that he intends to reassert Russian influence in the former communist states of Europe, whether those states want Russian influence or not. At the same time, he has also made it clear that he no longer sees Western nations as mere benign trading partners, but rather as Cold War-style threats." British historian Max Hastings described Putin as "Stalin's spiritual heir" in his article "Will we have to fight Russia in this Century?". British academic Norman Stone in his article "No wonder they like Putin" compared Putin to General Charles de Gaulle. Adi Ignatius argues that "Putin... is not a Stalin. There are no mass purges in Russia today, no broad climate of terror. But Putin is reconstituting a strong state, and anyone who stands in his way will pay for it". In the same article, Hastings continues that although "a return to the direct military confrontation of the Cold War is unlikely", "the notion of Western friendship with Russia is a dead letter" Both Russian and American officials always denied the idea of a new Cold War. So, the US Secretary of Defense Robert Gates said yet on the Munich Conference: "We all face many common problems and challenges that must be addressed in partnership with other countries, including Russia.... One Cold War was quite enough." Vladimir Putin said prior to 33rd G8 Summit, on 4 June 2007: "we do not want confrontation; we want to engage in dialogue. However, we want a dialogue that acknowledges the equality of both parties’ interests." Putin publicly opposed to a U.S. missile shield in Europe, presented President George W. Bush with a counterproposal on 7 June 2007 of sharing the use of the Soviet-era radar system in Azerbaijan rather than building a new system in Poland and the Czech Republic. Putin expressed readiness to modernize the Gabala radar station, which has been in operation since 1986. Putin proposed it would not be necessary to place interceptor missiles in Poland then, but interceptors could be placed in NATO member Turkey or Iraq. Putin suggested also equal involvement of interested European countries in the project. In a 4 June 2007, interview to journalists of G8 countries, when answering the question of whether Russian nuclear forces may be focused on European targets in case "the United States continues building a strategic shield in Poland and the Czech Republic", Putin admitted that "if part of the United States’ nuclear capability is situated in Europe and that our military experts consider that they represent a potential threat then we will have to take appropriate retaliatory steps. What steps? Of course we must have new targets in Europe." The end of 2006 brought strained relations between Russia and Britain in the wake of the death of a former FSB officer in London by poisoning. On 20 July 2007 UK Prime Minister Gordon Brown expelled "four Russian envoys over Putin's refusal to extradite ex-KGB agent Andrei Lugovoi, wanted in the UK for the murder of fellow former spy Alexander Litvinenko in London." The Russian constitution prohibits the extradition of Russian nationals to third countries. British Foreign Secretary David Miliband said that "this situation is not unique, and other countries have amended their constitutions, for example to give effect to the European Arrest Warrant". Miliband's statement was widely publicized by Russian media as a British proposal to change the Russian constitution. According to VCIOM, 62% of Russians are against changing the Constitution in this respect. The British Ambassador in Moscow Tony Brenton said that the UK is not asking Russia to break its Constitution, but rather interpret it in such a way that would make Lugovoi's extradition possible. Putin, in response, advised British officials to "fix their heads" rather than propose changing the Russian constitution and said that the British proposals were "a relic of a colonial-era mindset". When Litvinenko was dying from radiation poisoning, he allegedly accused Putin of directing the assassination in a statement which was released shortly after his death by his friend Alex Goldfarb. Critics have doubted that Litvinenko is the true author of the released statement. When asked about the Litvinenko accusations, Putin said that a statement released posthumously of its author "naturally deserves no comment". Presidents Bush and Putin at the 33rd G8 summit, June 2007. Following the Peace Mission 2007 military exercises jointly conducted by the Shanghai Cooperation Organisation (SCO) member states, Putin announced on 17 August 2007 the resumption on a permanent basis of long-distance patrol flights of Russia's strategic bombers that were suspended in 1992. US State Department spokesman Sean McCormack was quoted as saying in response that "if Russia feels as though they want to take some of these old aircraft out of mothballs and get them flying again, that's their decision." The announcement made during the SCO summit in the light of joint Russian-Chinese military exercises, first-ever in history to be held on Russian territory, makes some believe that Putin is inclined to set up an anti-NATO bloc or the Asian version of OPEC. 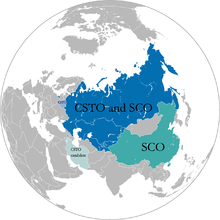 When presented with the suggestion that "Western observers are already likening the SCO to a military organisation that would stand in opposition to NATO", Putin answered that "this kind of comparison is inappropriate in both form and substance". Russian Chief of the General Staff Yury Baluyevsky was quoted as saying that "there should be no talk of creating a military or political alliance or union of any kind, because this would contradict the founding principles of SCO". The resumption of long-distance flights of Russia's strategic bombers was followed by the announcement by Russian Defense Minister Anatoliy Serdyukov during his meeting with Putin on 5 December 2007, that 11 ships, including the aircraft carrier Kuznetsov, would take part in the first major navy sortie into the Mediterranean since Soviet times. The sortie was to be backed up by 47 aircraft, including strategic bombers. According to Serdyukov, this is an effort to resume regular Russian naval patrols on the world's oceans, the view that is also supported by Russian media. The military analyst from Novaya Gazeta Pavel Felgenhauer believes that the accident-prone Kuznetsov is scarcely seaworthy and is more of a menace to her crew than any putative enemy. In September 2007, Putin visited Indonesia and in doing so became the first Russian leader to visit the country in more than 50 years. In the same month, Putin also attended the APEC meeting held in Sydney, Australia where he met with Australian Prime Minister John Howard and signed a uranium trade deal. This was the first visit of a Russian president to Australia. On 16 October 2007 Putin visited Tehran, Iran to participate in the Second Caspian Summit, where he met with Iranian leader Mahmoud Ahmadinejad. Other participants were leaders of Azerbaijan, Kazakhstan, and Turkmenistan. This is the first visit of a leader from the Kremlin to Iran since Joseph Stalin's participation in the Tehran Conference in 1943. At a press conference after the summit Putin said that "all our (Caspian) states have the right to develop their peaceful nuclear programmes without any restrictions". During the summit it was also agreed that its participants, under no circumstances, would let any third-party state use their territory as a base for aggression or military action against any other participant. On 26 October 2007, at a press conference following the 20th Russia-EU Summit in Portugal, Putin proposed to create a Russian-European Institute for Freedom and Democracy headquartered either in Brussels or in one of the European capitals, and added that "we are ready to supply funds for financing it, just as Europe covers the costs of projects in Russia". This newly proposed institution is expected to monitor human rights violations in Europe and contribute to development of European democracy. Russian President Vladimir Putin and ex-U.S. President George W. Bush failed to resolve their differences over U.S. plans for the planned missile defense system based in Poland and the Czech Republic, on their meeting in the Russian Black Sea resort of Sochi on 6 April 2008. Putin made clear that he does not agree with the decision to establish sites in the Eastern European countries, but said they had agreed a "strategic framework" to guide future U.S.-Russian relations, in which Russia and the U.S. said they recognized that the era in which each had considered the other to be a "strategic threat or enemy" was over. Putin expressed cautious optimism that the two sides could find a way to cooperate over missile defense and described his eight-year relationship as Russian president with Bush as "mostly positive". 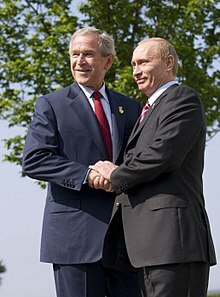 The summit was the final meeting between Bush and Putin as presidents and follows both leaders' attendance at last the NATO summit in Romania 2 April 2008 – 4 April 2008. That summit also highlighted differences between Washington and Moscow over U.S.-backed proposals to extend the military alliance to include the former Soviet republics of Ukraine and Georgia. Russia opposes the proposed expansion, fearing it will reduce its own influence over its neighbours.Fareed Zakaria suggests that the 2008 South Ossetia War turned out to be a diplomatic disaster for Russia. He suggests that it was a major strategic blunder, turning neighboring nations such as Ukraine to embrace the United States and other Western nations more. George Friedman, founder and CEO of private intelligence agency Stratfor, takes an opposite view, arguing that both the war and Russian foreign policy have been successful in expanding Russia's influence. "Russia’s foreign policy has always been and will remain self-sufficient and independent… it is consistent, successive and represents the unique role of our country in world affairs and civilization development which has formed over centuries. It has nothing to do with isolationism or confrontation, and provides for integration into global processes...We will continue strongly defending the United Nations Charter as a basis of the modern world order, and we will continue to push for everyone to proceed from the fact that only the United Nations Security Council has the right to make decisions in cases requiring the use of force"
The mid-2010s marked a dramatic downturn in Russian relations with the west, with some even considering it the start of a new Cold War. The United States and Russia back opposing sides in the Syrian Civil War, and Washington regarded Moscow as obstructionist regarding its support for the Bashar al-Assad government. In 2013, for the first time since 1960, the United States cancelled a summit with Russia after the latter granted asylum to Edward Snowden. The greatest increase in tensions, however, came during the Ukraine crisis that began in 2014, which saw the Crimean peninsula annexed by Russia. Russia also inflamed a separatist uprising in the Donbass region, though Moscow continues to deny its involvement. The United States responded to these events by putting forth sanctions against Russia, and most European countries followed suit, worrying about Russian interference in the affairs of central and Eastern Europe. October 2015 saw Russia, after years of supporting the Syrian government indirectly, directly intervene in the conflict, turning the tide in favor of the Assad regime. Russia's relations with Turkey, already strained over its support for the Assad regime, deteriorated further during this period, especially after the Turkish Air Force shot down a Russian jet fighter on 24 November 2015. In 2015, Russia also formed the Eurasian Economic Union with Armenia, Kazakhstan, and Belarus. The Russian government also remains bitter over the expansion of NATO into Eastern Europe, arguing that western leaders promised that NATO would not expand beyond its 1990s borders. For decades, the dispute between Japan and Russia over the ownership of the Kuril Islands has hindered closer cooperation between the two countries, but since 2017 high level talks involving Prime Minister Shinzō Abe have been ongoing in an attempt to resolve the situation. Russia has an Embassy in Algiers and a consulate in Annaba. Algeria has an Embassy in Moscow. Russia has an embassy in Cotonou, and Benin has an embassy in Moscow. Botswana and the Soviet Union initiated diplomatic relations on 6 March 1970. Despite its pro-Western orientation, Botswana participated in the 1980 Summer Olympics. The present-day relations between the two countries are described as friendly and long standing. In March, the two countries also celebrated the 35th anniversary of establishing diplomatic relations. According to the minister of Foreign Affairs, Russia was one of the first countries to establish full diplomatic relations with Botswana. Trade and economic cooperation between Russia and Botswana are stipulated by the Trade Agreement of 1987 and the Agreement on Economic and Technical Cooperation of 1988. The Government of the Russian Federation and the Government of the Republic of Botswana signed the Agreement on Cultural, Scientific and Educational Cooperation in September 1999. Russia and Botswana have had fruitful cooperation in a variety of fields, particularly in human resource development. And Russia is still offering more scholarship in key sectors such as health, which is currently experiencing a critical shortage of manpower. Botswana also is one of the countries where Russian citizens do not require a visa. Russia has an embassy in Gaborone, while Botswana covers Russia from its embassy in Stockholm (Sweden) and an honorary consulate in Moscow. Diplomatic relations between Burkina Faso and the Soviet Union were established for the first time on 18 February 1967. After the breakup of the Soviet Union, Burkina Faso recognized Russia as the USSR's successor. However financial reasons has shut the embassies between the two nations. In 1992, the embassy of the Russian Federation in Ouagadougou was closed, and in 1996, the embassy of Burkina Faso in Moscow was closed. Russia has an embassy in Bujumbura. Burundi has an embassy in Moscow. Relations improved when Burundian relations with the west deteriorated. Russia has an embassy in Yaoundé, and Cameroon has an embassy in Moscow. Chad has an embassy in Moscow. Russia has an embassy in N'Djamena. In March 2018, Russia agreed to provide free military aid to the Central African Republic, sending small arms, ammunition, and 175 instructors to train the Central African Armed Forces. The advisers are believed to be members of the Wagner Group. Congo The Republic of the Congo has no embassy in Moscow. Russia has an embassy in Brazzaville. Djibouti 1978 * Russia has an embassy in Djibouti City, Djibouti. Egypt has an embassy in Moscow. Russia has an embassy in Cairo and a consulate-general in Alexandria. Russia currently has an embassy in Addis Ababa. Ethiopia has an embassy in Moscow. The Ethiopian ambassador to Russia is also accredited to Armenia, Azerbaijan, Belarus, Georgia, Kazakhstan, Kirgizstan, Moldova, Tajikistan, Turkmenistan, Ukraine, and Uzbekistan. The history of this relationship has its origins in the 19th century. Russia supplied the mountain guns the Ethiopian army used in the Battle of Adwa. More recently, the Soviet Union was a major source of military and economic aid under the Derg and during the People's Democratic Republic of Ethiopia. Relations are somewhat unsure owing to Russia's close ties with Ethiopia's neighboring rival, Sudan. Both countries have established diplomatic relations on 17 July 1965. Diplomatic relations were later established once again after the breakup of the Soviet Union. The Gambia has an embassy in Moscow. Russia is represented in the Gambia through its embassy in Dakar (Senegal). Russia has an embassy in Accra, and Ghana has an embassy in Moscow. In 2008, assurances from Russia's ambassador to Ghana concerning assistance to sustain the fight against mosquitoes and environmental pollution in the region were very much appreciated since they were the major problems confronting Accra. Guinea-Bissau has an embassy in Moscow, and Russia has an embassy in Bissau. Russia works on UN missions to help the people of Ivory Coast. The help is sometimes done from the Russian embassy in Abidjan, but is also done from the embassy in Accra, Ghana. From these point of view, Russia regarded the outcome of the extraordinary summit held in Dakar, Senegal, of the Economic Community for West African States. Russia has an embassy in Nairobi. Kenya has an embassy in Moscow. Liberia and Russia resumed bilateral relations in March 2010 and cited a recent exploration of mine by a Russian company as a sign of future trade relations. Russia sharply criticised the NATO-led military intervention in the Libyan civil war, though it chose not to use its veto power on the United Nations Security Council to block it. On 27 May 2011, Russian President Dmitri Medvedev said that although Moscow opposed the military operations, it believed Gaddafi should leave power. In early June 2011, Russian envoy Mikhail Margelov was received in Benghazi, the de facto headquarters of the Libyan opposition. Margelov's stated objective was to broker a truce between anti-Gaddafi forces and the Gaddafi-led government. He left Benghazi with an invitation from the NTC for Russia to open a representative office in the city, though it opted not to do so before recognising the council as Libya's sole legitimate representative, which it did on 1 September 2011. The establishment of diplomatic relations between Madagascar and the Soviet Union started on 29 September 1972. During the 2009 Malagasy political crisis, Russia's Foreign Minister Sergey Lavrov stated that Russia is "concerned by the increased frequency of attempts on the African continent to resort to non-constitutional methods of solving internal political problems." He went on to say that, in addition to increasing economic and social problems, the use of force is of concern and runs counter to democratic principles, whilst affirming Russia's support of the African Union's position. Madagascar has an embassy in Moscow. Russia has an embassy in Antananarivo. Russia has an embassy in Bamako, and Mali has an embassy in Moscow. Russia has an embassy in Nouakchott, and Mauritania has an embassy in Moscow. The Soviet Union and Mauritius established diplomatic relations on 17 March 1968. Russia has an embassy in Port Louis, and Mauritius has an embassy in Moscow, which was opened in July 2003. Mozambique-Russia relations date back to the 1960s, when Russia began to support the struggle of Mozambique's Marxist-oriented FRELIMO party against Portuguese colonialism. Most leaders of the FRELIMO were trained in Moscow. Diplomatic relations were formally established on 25 June 1975, soon after Mozambique gained its independence from Portugal. In June 2007, both Russia and Mozambique signed an agreement on economic cooperation. Russia has an embassy in Maputo while Mozambique has an embassy in Moscow. Namibia has an embassy to Russia in Moscow and Russia has an embassy to Namibia in Windhoek. Relations between Namibia and Russia were considered "excellent" in 2006 by then-Namibian Minister of Education Nangolo Mbumba, while Russia expressed a desire for even stronger relations, particularly in the economic field. Also in 2006, the Namibia-Russia Intergovernmental Commission on Trade and Economic Cooperation was officially opened during a visit by Russian Natural Resources Minister Yuri Trutnev to Windhoek. During said visit, the Minister said Russia was interested in investing in oil, hydro-electric power and tourism. In 2007, Russian Prime Minister Mikhail Fradkov held discussions with Namibian Deputy Prime Minister Nahas Angula and President Hifikepunye Pohamba in regards to the possibility of developing Namibia's significant uranium deposits with an aim towards creating a nuclear power plant in the country. In 2008, Trutnev returned to Namibia, this time to Swakopmund, to meet at the third annual Intergovernmental Commission. Top foreign ministry official Marco Hausiku and his deputy Lempy Lucas represented Namibia in discussions with Trutnev. Nigeria has an embassy in Moscow. Russia has an embassy in Abuja and a consulate-general in Lagos. Russia has an embassy in Dakar and Senegal has an embassy in Moscow. The Soviet Union established diplomatic relations with Senegal on 14 June 1962. Diplomatic relations between Seychelles and the Soviet Union were established on 30 June 1976, a day after the island nation gained its independence from the United Kingdom. Russia has an embassy in Victoria. Seychelles is represented in Russia through its embassy in Paris (France) and an honorary consulate in Saint Petersburg. Russia has an embassy in Pretoria and a consulate-general in Cape Town. South Africa has an embassy in Moscow. South African Department of Foreign Affaires about the relation with Russia. Russia has an embassy in Khartoum and Sudan has an embassy in Moscow. For decades, Russia and Sudan have maintained a strong economic and politically strategic partnership. Due to solidarity with both the United States and with the Soviet Union and with the allies of the two nations, Sudan declared neutrality and instead chose membership in the Non-Aligned Movement throughout the Cold War. Russo-Sudanese relations were minorly damaged when, in 1971 members of the Sudanese Communist Party attempted to assassinate then-president Gaafar Nimeiry, and Nimeiry pegged the blame on the USSR, thus enhancing Sudanese relations with the West, and were damaged again when Sudan supported the Mujahadeen in Afghanistan when the USSR invaded in 1979. Due to a common enemy, diplomatic cooperation between the two countries dramatically got back on track during the late 1990s and early 2000s, when Vladimir Putin was elected the President, and then the Prime Minister of Russia, and along with Chinese leader Hu Jintao opposed UN Peacekeepers in Darfur. Russia strongly supports Sudan's territorial integrity and opposes the creation of an independent Darfurian state. Also, Russia is Sudan's strongest investment partner in Europe and political ally in Europe, and Russia has repeatedly and significantly regarded Sudan as an important global ally in the African continent. For decades there have been Sudanese collegians studying in Russian universities. Both countries have signed diplomatic missions on 11 December 1961 Russia has an embassy in Dar es Salaam, and Tanzania has an embassy in Moscow. Russia has an embassy in Tunis, and Tunisia has an embassy in Moscow. Russia has an embassy in Kampala and Uganda has an embassy in Moscow. Russia has an embassy in Lusaka. Zambia is represented in Russia by its embassy in Moscow. Russia-Zimbabwe relations date back to January 1979, during the Rhodesian Bush War. The Soviet Union supported Joshua Nkomo's Zimbabwe African People's Union, and supplied them with arms; Robert Mugabe's attempts to gain Soviet support for his Zimbabwe African National Union were rebuffed, leading him to enter into relations with Soviet rival Beijing. After the end of the white regime in Zimbabwe, Robert Mugabe had strengthened his relations with both Beijing and Moscow as a result of intense western pressure on him. Russia maintains strong economic and political ties with Zimbabwe and both countries had vetoed the UN resolution imposing UN sanctions on Zimbabwe which was proposed by both the US and the UK on 12 July 2008. Argentina has an embassy in Moscow. Russia has an embassy in Buenos Aires. The Russian Federation and Barbados established formal diplomatic relations on 29 January 1993. In 2018 both nations celebrated 25 years of diplomatic ties and pledged closer collaboration. The two nations also discussed cultural exchanges and Russia working with Barbados' light oil and gas industry. And possible scholarships to Russian schools. Russia is represented in Barbados, through its embassy in Georgetown, Guyana. Both countries have established diplomatic relations on 25 June 1991. Belize immediately recognized Russia as the USSR's successor after the breakup of the Soviet Union. Russia is represented in Belize through its embassy in Mexico City and an honorary consulate in Belize City. With Bolivia the focus on relations with Russia is mainly economic, as opposed to political and strategic, as an agreement to invest in Bolivia's natural gas fields shows. It is seen to "help Latin America...[as it] expands Latin America's economic opportunities, diversifies its relationships...that's healthy." 2008 saw, as a first step to re-establish ties with Russia, the Bolivian government had plans to purchase a small batch of helicopters. Ambassador Leonid Golubev told The Associated Press that he would like to see Russia's ties to Bolivia one day "approach the level" of its growing partnership with Venezuela. Bolivia has an embassy in Moscow. Russia has an embassy in La Paz. Brazil–Russia relations have seen a significant improvement in recent years, characterized by an increasing commercial trade and cooperation in military and technology segments. Today, Brazil shares an important alliance with the Russian Federation, with partnerships in areas such as space and military technologies, and telecommunications. Brazil has an embassy in Moscow. Russia has an embassy in Brasília and consulates-general in Rio de Janeiro and São Paulo. Canada and Russia benefit from extensive cooperation on trade and investment, energy, democratic development and governance, security and counter-terrorism, northern issues, and cultural and academic exchanges. Canada has an embassy in Moscow. Russia has an embassy in Ottawa and consulates-general in Montreal and Toronto. Chile has an embassy in Moscow and two honorary consulates in Saint Petersburg and in Vladivostok. Colombia has an embassy in Moscow. Costa Rica has an embassy in Moscow. Russia has an embassy in San José. Holders of a Russian passport need a visa authorized by Costa Rica, or alternatively Costa Rican authorities will accept Russian nationals with a visa stamp for the European Union, Canada, USA, South Korea, or Japan valid for 90 days after arrival; with a tourist visa, Russians can stay in Costa Rica for a maximum of 90 days. In order to get a tourist visa, the person needs to apply for it in the closest Costa Rican embassy to where the person is living. He/she must have a valid passport and either have an invitation letter or a bank statement with enough money to survive the length of the stay in Costa Rica, plus proof of onward travel (ticket to exit Costa Rica & legal ability to travel to the destination stated on the ticket). Holders of a Costa Rican passport also need a visa from Russian authorities. Relations between the two countries suffered somewhat during the Boris Yeltsin administration, as Cuba was forced to look for new major allies, such as China, after the dissolution of the Soviet Union. Relations improved when Vladimir Putin was elected as the new Russian President. Putin, and later Dmitry Medvedev, emphasized re-establishing strong relations with old Soviet allies. In 2008, Medvedev visited Havana and Raúl Castro made a week-long trip to Moscow. In that same year the two governments signed multiple economic agreements and Russia sent tons of humanitarian aid to Cuba. Cuba, meanwhile, gave staunch political support for Russia during the 2008 South Ossetia war. Relations between the two nations are currently at a post-Soviet high, and talks about potentially re-establishing a Russian military presence in Cuba are even beginning to surface. Dominica and Russia have established diplomatic relations on 19 May 1995. In April 2018, Dominica appointed a resident ambassador to Russia. Ecuador has an embassy in Moscow. Russia has an embassy in Quito. El Salvador has an embassy in Moscow. Russia is accredited to El Salvador from its embassy in Managua, Nicaragua. During the New Jewel Movement, the Soviet Union tried to make the island of Grenada to function as a Soviet base, and also by getting supplies from Cuba. On October 1983, during the U.S. invasion of Grenada, U.S. President Ronald Reagan maintained that US Marines arrived on the island of Grenada, which was considered a Soviet-Cuban ally that would export communist revolution throughout the Caribbean. In November, at a joint hearing of Congressional Subcommittee, it was told that Grenada could be used as a staging area for subversion of the nearby countries, for intersection of shipping lanes, and for the transit of troops and supplies from Cuba to Africa, and from Eastern Europe and Libya to Central America. In December, the State Department published a preliminary report on Grenada, in which was claimed as an "Island of Soviet Internationalism". When the US Marines landed on the island, they discovered a large amount of documents, which included agreements between the Soviet Government, and the New Jewel Movement, recorded minutes of the Committee meetings, and reports from the Grenadian embassy in Moscow. Diplomatic relations between Grenada and the Soviet Union were severed in 1983 by the Governor General of Grenada. Eventually in 2002, Grenada re-established diplomatic relations with the newly formed Russian Federation. Both countries established diplomatic relations on 17 December 1970. Guyana is represented in Russia by its High Commission in London, United Kingdom. Russia is represented in Guyana by its embassy in Georgetown. Mexico has an embassy in Moscow. Russia has an embassy in Mexico City. Both countries signed diplomatic missions on 18 October 1979, a few months after the Sandinista revolution. President Vladimir Putin visited Nicaragua on 12 July 2014. Nicaragua has an embassy in Moscow. Russia has an embassy in Managua. Panama has an embassy in Moscow. Russia has an embassy in Panama city. Paraguay has an embassy in Moscow. Russia is represented in Paraguay through its embassy in Buenos Aires (Argentina) and an honorary consulate in Asunción. On 13 September 2007, Russia's acting foreign minister, Sergei Lavrov, declared to soon open a resident embassy in Paraguay's capital. The nations have begun discussing cooperation in the areas of agriculture, fishing, shipbuilding, education, along with trade. In October 2013, the Surinamese foreign minister, Yldiz Pollack-Beighle visited Moscow for talks on concluding military and joint law enforcement training. Both countries have signed diplomatic missions on 6 June 1974. Russia is represented in Trinidad and Tobago through a non-resident embassy in Georgetown (Guyana). Both countries have interests with each other since the Soviet Union. In August 1992, Trinidad recognized Russia as the USSR's successor. In 2004, Sergey Lavrov and Knowlson Gift signed the protocol on the political consultations between the two Ministries. In April 2005 the Chamber of Commerce and Industry of the Russian Federation and the Chamber of Industry and Commerce of the Republic of Trinidad and Tobago signed the cooperation agreement. In 2004, the Russian Cossack folk dance had nine concerts in Port of Spain, San Fernando, Couva, and Tobago. Russia has an embassy in Washington, D.C. and has consulates-general in Houston and New York City. United States has an embassy in Moscow and consulates-general in Vladivostok and Yekaterinburg. Russia has an embassy in Montevideo and Uruguay has an embassy in Moscow. Russia is looking for cooperation with Uruguay in the field of nuclear energy, the Russian ambassador to Latin America said: "Our countries could maintain cooperation in the sphere of nuclear energy although Uruguay's legislation bans the use of nuclear energy". The diplomat said Uruguayan officials had shown interest in a floating nuclear power plant, when the project's presentation took place at the Russian Embassy recently. The first floating plant will have capacity of 70 MW of electricity, and about 300 MW of thermal power. The cost of the first plant is estimated at US$400 million, but could later be reduced to $240 million. This year marks the 150th anniversary of diplomatic relations between Russia and Uruguay. Russia has an embassy in Caracas. Venezuela has an embassy in Moscow. Afghanistan and Russia have shared a highly varied relationship from the mid-19th century to the modern day. For decades, Russia and Britain struggled for influence in Afghanistan, strategically positioned between their two empires, in what became known as "The Great Game". Following the 1917 Bolshevik Revolution, the new Soviet Union established more cordial relations with Afghanistan, and in 1919 became the first country to recognise Afghan sovereignty. Relations between the two nations became complicated following the 1978 communist coup known as the Saur Revolution. The new communist Democratic Republic of Afghanistan was highly dependent on the Soviet Union, and the Soviet support for the widely disliked communist regime, and the ensuing Soviet–Afghan War, led to a great hatred for the Soviets in much of the Afghan population. The Soviets occupied Afghanistan in the face of a bitter ten-year insurgency before withdrawing in 1989. Even following the withdrawal of Soviet forces, the Soviet Union provided massive support to the embattled DRA government, reaching a value of $3 billion a year in 1990. However, this relationship dissolved in 1991 along with the dissolution of the Soviet Union itself. On 13 September 1991, the Soviet government, now dominated by Boris Yeltsin, agreed with the United States on a mutual cut off of military aid to both sides in the Afghan civil war beginning on 1 January 1992. The post-coup Soviet government then attempted to develop political relations with the Afghan resistance. In mid-November it invited a delegation of the resistance's Afghanistan Interim Government (AIG) to Moscow where the Soviets agreed that a transitional government should prepare Afghanistan for national elections. The Soviets did not insist that Najibullah or his colleagues participate in the transitional process. Having been cut adrift both materially and politically, Najibullah's faction torn government began to fall apart, and the city of Kabul fell to the Mujahideen factions in April 1992. In 2009, Russian President Dmitry Medvedev announced that he wanted to be more involved in Afghanistan, supporting development of infrastructure and the army. This came as relations between Afghan President Karzai and American President Obama reached a low. Russia recognized the Armenian Genocide in 1995. Armenia joined the Russian-led Eurasian Economic Union in 2015. It is estimated that there are between 2,500,000 and 2,900,000 Armenians in Russia. Russia has an embassy in Baku. Azerbaijan has an embassy in Moscow and consulate-general in Saint Petersburg. Azerbaijan also announced that it will open another consulate-general in Yekaterinburg. Russia has an embassy in Manama, and Bahrain has an embassy in Moscow. Relations can be traced back to 1971 during the independence war when the Soviet Union sympathised with the Mukti Bahini cause and offered their assistance in the conflict. Although the start of their relations were very favourable, Bangladesh and Russia's relations have fluctuated greatly from extremely warm during the early 1970s to an all-time low during the 1980s (attributed to the Soviet invasion of Afghanistan). After the dissolution of the Soviet Union Bangladesh established ties with all the former Soviet Republics including Russia and began diversifying into other areas such as education, cultural, military and energy. China has an embassy in Moscow and consulates-general in Irkutsk, Kazan, Khabarovsk, Saint Petersburg, Vladivostok and Yekaterinburg. Russia has an embassy in Beijing and consulates-general in Guangzhou, Hong Kong, Shanghai and Shenyang. Russia was one of the first countries to recognise East Timor’s independence and took part in nearly all UN aid programs, providing food and relief personnel, including civil and transport aviation pilots. After the shooting of José Ramos-Horta (former president of East Timor), the Russian ministry said; "The Russian side expresses its concern over the attempt on the life of the East Timor president, and hopes political stability in East Timor will be maintained, as a fundamental condition for a successful solution to the complicated problems it is facing. And in the interests of strengthening national unity and ensuring social and economic development." Russia is represented in East Timor through its embassy in Jakarta (Indonesia). During the Cold War, India and the Soviet Union enjoyed a strong strategic, military, economic and diplomatic relationship. After the collapse of the USSR, India improved its relations with the West but it continued its close relations with Russia. India is the second-largest market for the Russian arms industry. In 2004, more than 70% of the Indian Military's hardware came from Russia, making Russia the chief supplier of arms. Since 2000 and the visit of Vladimir Putin in India, there has been an Indo-Russian Strategic Partnership. India has an embassy in Moscow and two consulates-general (in Saint Petersburg and Vladivostok). Russia has an embassy in New Delhi and three consulates-general (in Chennai, Kolkata, Mumbai). Russia is represented in Indonesia especially an Embassy in Jakarta. Russian Ambassador to Indonesia Ludmilla Georgievna serve as the First Female Russian Ambassador to Indonesia since 2018. Early in the Cold War, both countries had very strong relations, with Indonesian president Sukarno visiting Moscow and Soviet leader Nikita Khrushchev visiting Jakarta. When Sukarno was overthrown by General Suharto, relations between the two states were significantly deteriorated, likely due to Indonesia's enforced anti-communist policy under Suharto following the 1965 unrest. However, unlike the relations with China during Suharto's rule, the diplomatic relations were not suspended and remained intact. During this time, Indonesia is also one of many countries that boycotted the 1980 Moscow Olympics. Indonesia's negative views of the Soviet Union had significantly increased following the 1979 Soviet-Afghan War, with many Indonesians claiming it as a "communist crime against Muslims". Indonesian President Suharto will travel to the Soviet Union in September for his first visit to Moscow since taking power more than two decades ago, the government announced Wednesday. Official talks between Suharto and Soviet leader Mikhail Gorbachev are scheduled for 11–12 Sep in the Kremlin. Relations between the Soviet Union and Indonesia grew tense 20 years ago after a failed communist-inspired coup attempt, but a thaw began when Gorbachev came to power. The USSR under Gorbachev began to develop closer ties with Indonesia alongside other Southeast Asian countries, and relations between the two states were improving once again since the formation of the modern-day Russian Federation. Under Boris Yeltsin and later Vladimir Putin, relations were generally stable and continued to the present day. The Soviet Union established diplomatic relations with the Kingdom of Iraq on 9 September 1944.
in November 1947, the Soviet Union, together with the other Soviet bloc countries voted in favor of the United Nations Partition Plan for Palestine, which paved the way for the creation of the State of Israel. On 17 May 1948, three days after Israel declared its independence, the Soviet Union officially granted de jure recognition of Israel, becoming the second country to recognise the Jewish state (preceded by the United States' de facto recognition) and the first country to grant Israel de jure recognition. Japan has an embassy in Moscow and consulates-general in Khabarovsk, Saint Petersburg, Vladivostok and Yuzhno-Sakhalinsk. Russia has an embassy in Tokyo and consulates-general in Niigata, Osaka and Sapporo. Russia has an embassy in Amman, while Jordan has an embassy in Moscow. Both countries had established diplomatic relations on 20 August 1963. Diplomatic relations between Russia and Kazakhstan have fluctuated since the fall of the Soviet Union but both nations remain particularly strong partners in regional affairs and major supporters of the Collective Security Treaty Organization, Shanghai Cooperation Organisation and Eurasian Economic Union. Kazakhstani-Russian relations have been strained at times by Astana's military and economic cooperation with the United States as well as negotiations over Russia's continued use of the Baikonur Cosmodrome, however the two nations retain high-level military and economic cooperation perhaps second among former Soviet states only to that between Russia and Belarus. Kazakhstan sells oil and gas to Russia at a significantly reduced rate and Russian businesses are heavily invested in Kazakhstan's economy. Whereas the other Central Asian republics have sometimes complained of Russian interference, Kyrgyzstan has more often wished for more attention and support from Moscow than it has been able to obtain. For all the financial support that the world community has offered, Kyrgyzstan remains economically dependent on Russia, both directly and through Kazakhstan. In early 1995, Askar Akayev, the then President of Kyrgyzstan, attempted to sell Russian companies controlling shares in the republic's twenty-nine largest industrial plants, an offer that Russia refused. Laos has an embassy in Moscow. Russia has an embassy in Vientiane. The "Artillery Square" in Beirut witnessed battles involving the Russian naval forces that were brought to the port of "St. George" to fight alongside the people who rose up against the Turkish rule. That was in 1773. What was the uprising of the people at that time as resistance to the "Ottoman occupation". The naval forces set up their artillery at Beirut Square, which still bears the name "Artillery Square" and buried its soldiers who fought the Turks with the Lebanese soldiers in the cemetery of the Orthodox Church of St.Meter in Achrafieh. Diplomatic relations between the two countries began even before the Lebanese independence. In 1839, Russia opened its first consulate in Beirut. At 1946 , the Soviet Union , the first country in the world for the first time in the history of the UN veto-wielding to support Lebanon and Syria's total independence. Russia has an embassy in Kuala Lumpur, and Malaysia has an embassy in Moscow. Relations between Mongolia and the Russian Federation have been traditionally strong since the Communist era, when Soviet Russia was the closest ally of the Mongolian People's Republic. Russia has an embassy in Ulaanbaatar and two consulate generals (in Darkhan and Erdenet). Mongolia has an embassy in Moscow, three consulate generals (in Irkutsk, Kyzyl and Ulan Ude), and a branch in Yekaterinburg. Both countries are full members of the Organization for Security and Co-operation in Europe (Russia is a participating state, while Mongolia is a partner). After the disintegration of the former Soviet Union, Mongolia developed relations with the new independent states. Links with Russia and other republics were essential to contribute to stabilisation of the Mongolian economy. The primary difficulties in developing fruitful coordination occurred because these new states were experiencing the same political and economic restructuring as Mongolia. Despite these difficulties, Mongolia and Russia successfully negotiated both a 1991 Joint Declaration of Cooperation and a bilateral trade agreement. This was followed by a 1993 Treaty of Friendship and Cooperation establishing a new basis of equality in the relationship. Mongolian President Bagabandi visited Moscow in 1999, and Russian President Vladimir Putin visited Mongolia in 2000 in order to sign the 25-point Ulaanbaatar Declaration, reaffirming Mongol-Russian friendship and cooperation on numerous economic and political issues. China and Russia once vetoed a U.N. Security Council resolution designed to punish Myanmar. Relations improved even more when relations with the west deteriorated, following the Rohingya crisis. Nepal and the Soviet Union had established diplomatic relations in 1956. After the collapse of the Soviet Union, Nepal extended full diplomatic recognition to the Russian Federation as its legal successor. Since then numerous bilateral meetings have taken place between both sides. Since 1992 numerous Nepalese students have gone to Russia for higher studies on a financial basis. In October 2005 the Foreign ministers of both countries met to discuss cooperation on a variety of issues including political, economic, military, educational, and cultural. Both countries maintain embassies in each other's capitals. Russia has an embassy in Kathmandu while Nepal has an embassy in Moscow. North Korean embassy in Moscow, Russia. Russia–DPRK relations are determined by Russia's strategic interests in Korea and the goal of preserving peace and stability in the Korean peninsula. Russia's official position is by extension its stance on settlement of the North Korean nuclear crisis. Relations between these two countries have been strained in the past, because of Pakistan's close ties to America and its support for the Afghan rebels during the invasion by the USSR. Russia has an embassy in Riyadh. Saudi Arabia has an embassy in Moscow. Singapore maintains an embassy in Moscow and Russia has an embassy in Singapore. Singapore and the Soviet Union (now Russia) entered into full diplomatic relations on 1 June 1968. The two nations engaged in trade and economic cooperation. After the start of Vladimir Putin's term, Singapore and Russia strengthened ties, participating in a number of regional meetings such as the ASEAN-Russia Summit and the ASEAN Regional Forum. Both Singapore and Russia are members of APEC. Russia has an embassy in Seoul and a consulate-general in Busan. South Korea has an embassy in Moscow and consulates-general in Irkutsk, Saint Petersburg, Vladivostok and a consular office in Yuzhno-Sakhalinsk. During the war between the Sri Lanka Armed Forces (Government of Sri Lanka) and Tamil Tigers, Russia helped Sri Lanka by providing education on battle field tactics to Sri Lanka Army. Sri Lanka also reacted in favor of Russia during the Ukrainian crisis, and acknowledged the concerns of Russia as justifiable. Russia has an embassy in Colombo. Sri Lanka has an embassy in Moscow. Russia has an embassy in Damascus and a consulate in Aleppo, and Syria has an embassy in Moscow. As with most of the Arab countries, Russia enjoys a historically strong and stable friendly relationship with Syria. Since 1971, Russia has leased port facilities in Tartus for its naval fleet. Between 1992 and 2008 these facilities were much in disrepair, however, works have commenced concurrent with the 2008 South Ossetia war to improve the port's facilities to support an increased Mediterranean presence of the Russian Navy. Russia is believed to have sent Syria dozens of Iskander missiles. Russia has been strongly supporting Syria in the Syrian civil war, especially since the start of an air campaign in 2015. In the Chinese Civil War, the Soviet Union had a tumultuous yet strategic relations with the Kuomintang-led Nationalist China until 1949 with the proclamation of the People's Republic of China and the subsequent military takeover of Mainland China by the Chinese Communist Party. In the Second Taiwan Strait Crisis, the Soviet Union under the leadership of Nikita Khrushchev recommended the internationalization of the Taiwan Question and appealed to the United Nations and other multilateral organizations to erase the crisis, further, the Communist Party of the Soviet Union called for the Ten Nations Summit in New Delhi to discuss the issue and eradicate the military tension on 27 September 1958 and undermined as one of the precursors of the latter Sino-Soviet split. Since the formation of the Russian Federation, Taiwan has exported many ferric materials to Russia in 2004–2005. In 2005, the total amount of the trade between the two economies was $2,188,944,473. Russia also has a representative office in Taipei, and Republic of China has a representative office in Moscow. According to the data, Russia keeps a positive balance in its trade relations with Taiwan mainly from crude oil, cast iron and steel, nonferrous metals, petrochemical products, ferroalloys, coking coal, timber, and chemical fertilizers. Russia imports mostly electronics and electronic parts, computers and computer parts, and home appliances. The two countries cooperate closely and intensely by establishing unofficial diplomatic relations since 1993~1996. Taipei is targeting Russia for exporting opportunities and marketing potentials and this mutually-beneficial relationship is effective, especially under the framework of APEC. Until 2005, Russia had 11,000 border guards manning the Tajik frontier with Afghanistan. In September 2012, and after months of negotiating, Russia and Tajikistan have reached an agreement on what Russia will pay for its bases in Tajikistan and extended the lease to 20 or 29 years. The bases are used for 9,000 Russian troops of the 201st Motor Rifle Division. The new deal with Tajikistan makes it worthwhile for Russia to upgrade the four army camps and one air base they occupy. To get the long lease, Russia agreed to sell Tajikistan weapons and military equipment at a sharp discount and train Tajik officers in Russian schools, for free, for the duration of the deal. Tajikistan also promises to help keep the heroin out of Russia. Russia has an embassy in Ashgabat and a consulate-general in Türkmenbaşy. Turkmenistan has an embassy in Moscow. Recently, Russian-Turkmenistan relations have revolved around Russia's efforts to secure natural gas export deals from Turkmenistan. Russia is competing with China, the European Union, India and the United States for access to Turkmenistan's rich supply of hydrocarbons. The two countries often lock horns over price negotiations for gas exports to Russia. Turkmen president Gurbanguly Berdimuhamedow has agreed to help supply and expand the Russian-backed Pricaspiysky pipeline, however no action has yet occurred towards this goal. Russia has an embassy in Abu Dhabi and a consulate-general in Dubai. United Arab Emirates has an embassy in Moscow. Russia has an embassy in Tashkent. Uzbekistan was once a former Soviet Socialist republic. It still has strong ties to Russia and the West. In the aftermath of the May 2005 unrest, Uzbekistan demanded that the United States leave the base at Karshi-Khanabad. In November 2005, both presidents Islam Karimov and Vladimir Putin had signed a mutual cooperation agreement in Moscow. USSR was an ally of Vietnam. On 30 January 1950 the Union of Soviet Socialist Republics established an embassy to North Vietnam. The USSR was traditionally one of Vietnam's strongest allies. Albania has an embassy in Moscow. Russia has an embassy in Tirana. Bosnia is one of the countries where Russia has contributed troops for the NATO-led stabilization force. Others were sent to Kosovo and Serbia. Russia has an embassy in Brussels and a consulate-general in Antwerp, whilst Belgium has an embassy in Moscow and an honorary consulate in Saint Petersburg. Bulgaria has an embassy in Moscow and 3 consulates general (in Saint Petersburg, Novosibirsk and Yekaterinburg). Russia has an embassy in Sofia and 2 consulates general (in Ruse and Varna). Russia was the first country to recognize Bulgaria, and greatly helped Bulgaria in its war of independence from Ottoman Turkey. Croatia has an embassy in Moscow and an honorary consulate in Kaliningrad. Russia has an embassy in Zagreb. The present day relations between the two countries are at their best, and many agreements have been signed. Russia also has further reduced its oil deliveries to the Czech Republic. The Czech Republic has an embassy in Moscow, and two consulate generals (in Saint Petersburg and Yekaterinburg). The Russian Federation has an embassy in Prague, and two consulate generals in (Brno and Karlovy Vary). Russia has an embassy in Copenhagen. Denmark has an embassy in Moscow, a consulate-general in Saint Petersburg. Russia recognised Estonia via the Tartu Peace Treaty on 2 February 1920. Russian-Estonian relations were re-established in January 1991, when presidents Boris Yeltsin of RSFSR and Arnold Rüütel of the Republic of Estonia met in Tallinn and signed a treaty governing the relations of the two countries after the anticipated independence of Estonia from the Soviet Union. The treaty guaranteed the right to freely choose their citizenship for all residents of the former Estonian SSR. Russia re-recognised the Republic of Estonia on 24 August 1991 after the failed Soviet coup attempt, as one of the first countries to do so. The Soviet Union recognised the independence of Estonia on 6 September. Estonia's ties with Boris Yeltsin weakened since the Russian leader's initial show of solidarity with the Baltic states in January 1991. Issues surrounding the withdrawal of Russian troops from the Baltic republics and Estonia's denial of automatic citizenship to persons who settled in Estonia in 1941-1991 and offspring ranked high on the list of points of contention. Germany tries to keep Russia engaged with the rest of the Western world. The future aim is to promote a stable market-economy liberal democracy in Russia, which is part of the Western world. Holy See 2009 See Holy See–Russia relations. Hungary has an embassy in Moscow and two consulate-generals (in Saint Petersburg and Yekaterinburg). Russia has an embassy in Budapest and a consulate-general in Debrecen. Until 1917, Latvia had been part of the Russian empire. Following the Latvian declaration of independence, war broke out between Latvia and the Russian SFSR. Diplomatic relations between the two countries were first established in 1920, following the conclusion of a Soviet-Latvian peace treaty on 11 August 1920. The treaty was ratified by the Latvian Constituent Assembly on 2 September, and by the Latvian government on 25 September. On the Russian side, it was ratified by the Pan Russian Central Executive Committee on 9 September. Ratification letters were exchanged between the two governments in Moscow on 4 October, the date on which in entered into effect. These relations lasted until the Soviet take over of Latvia in 1940. Following the collapse of the Soviet Union, the Russian government recognized the independence of Latvia on 24 August 1991. Russia expresses concern for how Latvia's language and naturalization laws effect Latvia's Russian-speaking population. Russians comprised 27.6% of the population in 2010. In turn, Latvia is interested in the welfare of ethnic Latvians still residing in Russia. The latest Russian census shows about 40,000 still living in Russia, but sources indicate that given the probability of an undercount, Latvians in Russia probably number about 50,000-60,000. Norway has an embassy in Moscow and a consulate-general in Saint Petersburg and a consulate in Murmansk. Russia has an embassy in Oslo and consulates-general in Barentsburg and Kirkenes. In recent years, relations with Russia have worsened considerably. Poland responded with strong disapproval towards the 2008 Georgian Crisis, in which a military invasion of Georgia was led by Russia. Georgia is a former USSR republic, Poland was a member of the Eastern Bloc, and Poland stated its support for Georgia and condemned Russia's actions. The Polish believed the invasion was carried out by the Russians in an attempt to reestablish and reassert its dominance over its former republics. Since 2009, however, relations with Russia somewhat improved - despite the plane accident where the former Polish president died on what is still considered a controversial event. After the Annexation of Crimea by the Russian Federation the relations deteriorated again, as Poland strongly condemned Russian actions against Ukraine. Poland has an embassy in Moscow and consulates-general in Irkutsk, Kaliningrad and Saint Petersburg. Russia has an embassy in Warsaw and consulates-general in Gdańsk, Kraków and Poznań. Russia has an embassy in Belgrade and a liaison office to UNMIK in Pristina. Diplomatic relations between the Kingdom of Yugoslavia and the Soviet Union were established on 24 June 1940, and Serbia and the Russian Federation recognize the continuity of all inter-State documents signed between the two countries. There are about 70 bilateral treaties, agreements and protocols signed in the past. Serbia and the Russian Federation have signed and ratified 43 bilateral agreements and treaties in diverse areas of mutual cooperation so far. Russia opened its embassy in Bratislava in 1993. Slovakia has an embassy in Moscow. Russia has an embassy in Ljubljana. Slovenia has an embassy in Moscow and two honorary consulates (in Saint Petersburg and Samara). Switzerland opened a consulate in Saint Petersburg in 1816, upgrading it to a legation 90 years later. The two countries broke off diplomatic relations in 1923, when Russia was going through a period of revolutionary turmoil – and they were not resumed until 1946. Russia has an embassy in Bern and a Consulate-General in Geneva. Switzerland has an embassy in Moscow and since 2006, a Consulate-General in Saint Petersburg. Russia has an embassy in Kiev and consulates-general in Kharkiv, Lviv and Odessa. Ukraine has an embassy in Moscow and consulates-general in Rostov-on-Don, Saint Petersburg, Tyumen and Vladivostok. Russia has an embassy in London and a consulate-general in Edinburgh. United Kingdom has an embassy in Moscow and consulates-general in Saint Petersburg and Yekaterinburg. The first Australian embassy in Moscow opened in 1943. Australia has an embassy in Moscow and two honorary consulates (in Saint Petersburg and Vladivostok). Russia has an embassy in Canberra and a consulate-general in Sydney. Russia is represented in Nauru through its embassy in Canberra (Australia). Russia's ambassador to Australia Alexander Blokhin serves concurrently as Russia's non-resident ambassador to Nauru (as well as to Fiji and Vanuatu). Nauru's banks are said to have provided services to the mafia in Russia during the 1990s; over the course of the 1990s, approximately 70 billion U.S. dollars owned by Russian mafia were held in Nauru banks. In 2009, Nauru became the fourth country to recognize the states of Abkhazia and South Ossetia, breakaway regions of Georgia. Only three other UN member states have done so. Russia was reported to be giving Nauru $50M in humanitarian aid in exchange. New Zealand has an embassy in Moscow and an honorary consulate in Vladivostok. Russia has an embassy in Wellington. Both countries are members of APEC. Palau and Russia have had established diplomatic relations since 28 November 2006. The Kingdom of Tonga and the Soviet Union established formal diplomatic relations in 1976. Tonga was the first Pacific Island country to establish relations with the USSR. The USSR was dissolved in 1991 and was succeeded by Russia as the successor state. On 2 October 2005, Minister of Foreign Affairs of the Russian Federation Sergey Lavrov and Minister of Foreign Affairs of the Kingdom of Tonga ST T. Tupou exchanged telegrams offering congratulations on the occasion of 30th anniversary of establishing diplomatic relations between the two nations. In his heads of foreign ministries of Russia and Tonga expressed confidence in further development of Russian-Tongan relations in the interests of the peoples of both countries and strengthen peace and security in the Asia-Pacific region. Russia has a non-resident ambassador based in Canberra, Australia. Russia and Tuvalu established diplomatic relations with Russia on 25 September 2011. In 1987, Vanuatu authorised Soviet vessels to fish within Vanuatu's Exclusive Economic Zone, in exchange for economic aid. The agreement lapsed the following year, and was not renewed, due to disagreements over the price to be paid for fishing rights by the USSR. Pew Research Center indicated that (as of 2015) only 4 surveyed countries have a positive view (50% or above) of Russia. The top ten most positive countries are Vietnam (75%), Ghana (56%), China (51%), South Korea (46%), Lebanon (44%), Philippines (44%), India (43%), Nigeria (39%), Tanzania (38%), Ethiopia (37%), and Uganda (37%). While ten surveyed countries have the most negative view (Below 25%) of Russia. With the countries being Pakistan (12%), Turkey (15%), Poland (15%), United Kingdom (18%), Jordan (18%), Ukraine (21%), Japan (21%), United States (22%), Mexico (24%), and Australia (24%). Russian's own view of Russia was overwhelmingly positive at 92%. "Russian aggression" or the portrayal of Russia as an aggressive actor has been the subject of political analysis. Reference to "Russian aggression" is common in Western media where it is used to criticize Russia. It has been used to refer to both Catherine the Great's 18th century agenda and 21st century Russian policies. In the 1990s supporters of NATO expansion into Eastern Europe claimed this would diminish "Russian aggression". The post-Maidan conflict in Ukraine is usually blamed on "Russian aggression".NATO-sponsored analysts have described what they call a cybernetic "Russian aggression" against Ukraine in the 2010s. Russia is a member of the Commonwealth of Independent States (CIS), Union of Russia and Belarus, Organization for Security and Cooperation in Europe (OSCE), Paris Club, and the North Atlantic Cooperation Council (NACC). It signed the NATO Partnership for Peace initiative on 22 June 1994. On 20 May 1997, NATO and Russia signed the NATO–Russia Founding Act, which the parties hoped would provide the basis for an enduring and robust partnership between the Alliance and Russia—one that could make an important contribution to European security architecture in the 21st century, though already at the time of its signing doubts were cast on whether this accord could deliver on these ambitious goals. This agreement was superseded by the NATO–Russia Council that was agreed at the Reykjavik Ministerial and unveiled at the Rome NATO Summit in May 2002. On 24 June 1994, Russia and the European Union (EU) signed a partnership and cooperation agreement. In recent years, tensions have heightened, as NATO members in Eastern Europe, especially Latvia, Lithuania, Estonia, and Poland, feel threatened by Russia. European Union imposed sanctions on Russian businesses and individuals in 2014, regarding the annexation of Crimea and alleged support for separatists during Donbass War. The non-Russian countries that were once part of the USSR have been termed the 'near abroad' by Russians. More recently, Russian leaders have been referring to all 15 countries collectively as "Post-Soviet Space," while asserting Russian foreign policy interest throughout the region. After the USSR was dissolved by the presidents of Russia, Ukraine and Belarus, Russia tried to regain some sort of influence over the post-Soviet space by creating, on 8 December 1991, a regional organization – the Commonwealth of Independent States. The following years, Russia initiated a set of agreements with the Post-Soviet states which were designed to institutionalize the relations inside the CIS. However, most of these agreements were not fulfilled and the CIS republics began to drift away from Russia, which at that time was attempting to stabilize its broken economy and ties with the West. One of the major issues which had an influence on the foreign relations of Russia in FSU was the remaining large Russian minority populations in many countries of the near abroad. This issue has been dealt with in various ways by each individual country. They have posed a particular problem in countries where they live close to the Russian border, such as in Ukraine and Kazakhstan, with some of these Russians calling for these areas to be absorbed into Russia. By and large, however, Russians in the near-abroad do not favor active intervention of Russia into the domestic affairs of neighboring countries, even in defense of the interests of ethnic Russians. Moreover, the three Baltic states (Estonia, Latvia, and Lithuania) have clearly signaled their desire to be outside any claimed Russian sphere of influence, as is reflected by their joining both the NATO alliance and the European Union in 2004. Close cultural, ethnic and historical links exist between Russia, Belarus and Ukraine. The traditional Russian perspective is that they are one ethnic group, with Russians called 'Great Russians', Belarusians 'White Russians' and Ukrainians 'Little Russians'. This manifested itself in lower levels of nationalism in these areas, particularly Belarus and Ukraine, during the disintegration of the Soviet Union. However, few Ukrainians accept a "younger brother" status relative to Russia, and Russia's efforts to insert itself into Ukrainian domestic politics, such as Putin's endorsement of a candidate for the Ukrainian presidency in the last election, are contentious. Russia maintains its military bases in Armenia, Belarus, Kyrgyzstan, Moldova, and Tajikistan. Russia's relationships with Georgia are at their lowest point in modern history due to the Georgian-Russian espionage controversy and due to the 2008 Russo-Georgian war, Georgia broke off diplomatic relations with Russia and has left the Commonwealth of Independent States. Russia's relations with Ukraine, since 2013, are also at their lowest point in history as a result of the pro-Western Euromaidan revolution in Ukraine, the 2014 Crimean Crisis and the pro-Russian insurgency in Ukraine's Donetsk and Luhansk regions. Ukraine, like Georgia, has introduced a bill to the Verkhovna Rada to withdraw from the Commonwealth of Independent States, and Kiev has begun the process of doing so. In addition, Russia also maintains relations with Bulgaria, Czech Republic, part of the former East Germany, Hungary, Poland, Romania and Slovakia, the countries that were once part of the former Warsaw Pact, and furthermore, Albania. Russia also continues to maintain friendly relations with Cuba, Mongolia and Vietnam as well as third world and non-aligned countries of Afghanistan, Angola, Benin, Cambodia, Congo, Egypt, Ethiopia, Grenada, Guinea-Bissau, India, Iraq, Laos, Mozambique, Serbia, Syria and the former Southern part of Yemen. Russia holds a permanent seat, which grants it veto power, on the Security Council of the United Nations (UN). Prior to 1991, the Soviet Union held Russia's UN seat, but, after the breakup of the Soviet Union the Russian government informed the United Nations that Russia will continue the Soviet Union's membership at the United Nations and all other UN organs. Russia has played an important role in helping mediate international conflicts and has been particularly actively engaged in trying to promote a peace following the Kosovo conflict. Russia's foreign minister claimed on 25 February 2008 that NATO and the European Union have been considering using force to keep Serbs from leaving Kosovo following the 2008 Kosovo declaration of independence. Russia is a co-sponsor of the Middle East peace process and supports UN and multilateral initiatives in the Persian Gulf, Cambodia, Burma, Angola, the former Yugoslavia, and Haiti. Russia is a founding member of the Contact Group and (since the Denver Summit in June 1997) a member of the G8. In November 1998, Russia joined the Asia-Pacific Economic Cooperation Forum (APEC). Russia has contributed troops to the NATO-led stabilization force in Bosnia and has affirmed its respect for international law and OSCE principles. Russia has accepted UN and/or OSCE involvement in instances of regional conflict in neighboring countries, including the dispatch of observers to Georgia, Moldova, Tajikistan, and the de-facto Republic of Artsakh. Russia supported, on 16 May 2007, the set up of the international tribunal to try the suspects in the murder of the Lebanese Prime Minister, Rafiq Hariri. The Kuril Islands dispute concerns the islands of Iturup, Kunashir, and Shikotan and the Khabomai group, all of which had belonged to the Japanese Empire until the Soviet–Japanese War when the Soviet Union occupied them and the southern part of the Sakhalin island. The Russian SFSR, then part of the USSR, got them at the end of the Second World War during the 1945 Yalta Conference, when the Allies agreed to the cession of the islands to the USSR. However, this stipulation was not included in the treaty of Capitulation of Japan which later gave Japan a chance to demand the return of the "controversial northern territories". However, the disputed territory is currently administered by the Russian Federation, and the majority of inhabitants of the disputed territory are supportive of Russian administration, because all the Japanese inhabitants were expelled from the islands in 1946. The dispute between Russia and Latvia regarding the Pytalovo (Abrene) area of Pskov Oblast, Russia, was settled in the 27 March 1997 border treaty. Disputes over the boundary with the People's Republic of China were finally resolved on 21 July 2008. On that day the Foreign Ministers of the two countries signed an agreement in Beijing. Under the agreement, Russia ceded approximately 174 km² of territory to China. The territory transferred comprised Tarabarov Island and approximately half of Bolshoy Ussuriysky Island. The area transferred was largely uninhabited. The settlement of their border dispute followed over 40 years of negotiations. The final settlement was the result of the Treaty of Good-Neighborliness and Friendly Cooperation which was concluded on 2 June 2005 and signed by Chinese Foreign Minister Li Zhaoxing and his Russian counterpart, Sergei Lavrov. This followed talks in Vladivostok. There is now no border dispute between Russia and China along their 4300 km border. Caspian Sea boundaries are not yet determined among all littoral states. Issues between Russia and the states bordering it – Azerbaijan and Kazakhstan – were settled in 2003. Russia has no common land or Caspian-sea border with Turkmenistan and Iran, which do not agree with the Caspian Sea settlements. Territorial issues between Estonia and Russia regarding some territories of Pskov and Leningrad Oblast of Russia are still unresolved. The 2005 treaty on Estonia–Russia border was not ratified by the Russian side. Negotiations were reopened in 2012 and the Treaty was signed in February 2014, but ratification is still pending. Russia has made no territorial claim in Antarctica (but has reserved the right to do so) and does not recognize the claims of any other nation. The Soviet Union signed the Antarctic Treaty in 1960. Disputes over the boundary with Georgia relating to Russia's recognition of Georgian regions, South Ossetia and Abkhazia as independent states, due to the 2008 South Ossetia war and which has led to the severance of all diplomatic relations between them. Following the breakup of the Soviet Union, the Russian Federation refused to recognize Ukrainian sovereignty over Sevastopol as well as over the surrounding Crimean Oblast, using the argument that the city was never practically integrated into the Ukrainian SSR because of its military status. This claim was relinquished in the bilateral Peace and Friendship Treaty, which confirmed that both the Crimea and Sevastopol belong to Ukraine. A separate treaty established the terms of a long-term lease of land and resources in and around Sevastopol by Russia. In the Annexation of Crimea by the Russian Federation of early 2014 Crimea was annexed by Russia. Since then status of the Crimea and of the city of Sevastopol is currently under dispute between Russia and Ukraine; Ukraine and the majority of the UN members consider Crimea to be an autonomous republic of Ukraine and Sevastopol to be one of Ukraine's cities with special status, while Russia and other UN members, on the other hand, consider Crimea to be a federal subject of Russia and Sevastopol to be one of Russia's federal cities. On 31 March 2014 the State Duma approved the denunciation of the above-mentioned Peace and Friendship Treaty and long-term lease of land in Sevastopol. ^ a b c 43rd Munich Conference on Security Policy. Putin's speech in English Archived 4 May 2008 at the Wayback Machine, 10 February 2007. ^ Interview Archived 4 May 2008 at the Wayback Machine for Indian Television Channel Doordarshan and Press Trust of India News Agency, 18 January 2007. ^ In this connection it is worth of mention that Putin's father, an NKVD officer, was nearly killed in Estonia, while on a sabotage mission during World War II . The fact may have had some influence on Vladimir Putin's attitudes, as suggested by Lynn Berry in the article "Behind Putin's Estonia Complex" (in Moscow Times, 25 May 2007). ^ David Holley (17 May 2007). "Russian Orthodox Church ends 80-year split". Los Angeles Times. ^ "Russia walks away from CFE arms treaty". AFP via The Financial Express. 12 December 2007. Retrieved 13 December 2007. ^ "Russia Suspends Participation In CFE Treaty". Radio Liberty. 12 December 2007. Retrieved 13 December 2007. ^ "US 'deeply regrets' Russia's 'wrong' decision on CFE". AFP. 12 December 2007. Retrieved 13 December 2007. ^ "Putin poised to freeze arms pact as assertiveness grows". Financial Times. 12 December 2007. Retrieved 13 December 2007. ^ No wonder they like Putin. by Norman Stone The Times 4 December 2007. ^ a b the Internet Department of the Presidential Press and Information Office (4 June 2007). "Interview with Newspaper Journalists from G8 Member Countries". The Presidential Press and Information Office. Archived from the original on 4 May 2008. ^ a b c d e f g Gonzalo Vina and Sebastian Alison (20 July 2007). "Brown Defends Russian Expulsions, Decries Killings". Bloomberg News. Archived from the original on 30 September 2007. ^ "Russia suspends British Council regional offices". Reuters. 10 December 2007. Retrieved 12 December 2007. ^ Guy Faulconbridge. Russian navy to start sorties in Mediterranean Reuters 5 December 2007. ^ Russia's Navy Has Resumed Presence in World Ocean Vzglyad.ru (Russian) 5 December 2007. ^ Павел Фельгенгауэр. Семь честных слов под килем Archived 20 May 2008 at the Wayback Machine Novaya Gazeta № 95 December 13, 2007. ^ "Bush, Putin disagree on missile defense". CNN. 1 April 2008. Archived from the original on 8 April 2008. Retrieved 6 April 2008. ^ Friedman, George (25 September 2008). "Georgia and the Balance of Power". The New York Review of Books. 55 (14). Retrieved 13 September 2008. ^ Sputnik. "Proactive Diplomacy Defends State Interests – Putin / Sputnik International". En.rian.ru. Retrieved 18 July 2015. ^ Patrick W. Quirk, "Russia–Syria Internal Threat Alliance (2010–2016)". in Quirk, Great Powers, Weak States, and Insurgency (Palgrave Macmillan, Cham, 2017). 179–213. ^ Cynthia Nolan, "The Edward Snowden Case and the Morality of Secrecy". Catholic Social Science Review 22 (2017): 291–310. ^ Michał. Natorski, "The EU and crisis in Ukraine: policy continuity in Times of Disorder?". in by Dimitris Bouris and Tobias Schumacher, eds. The Revised European Neighbourhood Policy (Palgrave Macmillan, 2017). 177–196. ^ Tracey German, "NATO and the enlargement debate: enhancing Euro-Atlantic security or inciting confrontation?". International Affairs 93.2 (2017): 291–308. ^ James D. J. Brown, "Japan's foreign relations with Russia". in James D. J. Brown and Jeff Kingston, eds. Japan's Foreign Relations in Asia (2018): 248–261. ^ "How the West Lost Burundi – Foreign Policy". Foreignpolicy.com. 28 August 2015. Retrieved 2 January 2019. ^ "Главная страница". Capeverde.mid.ru. Retrieved 26 August 2018. ^ "Cabo Verde - The Ministry of Foreign Affairs of the Russian Federation". Mid.ru. 9 December 2014. Retrieved 26 August 2018. ^ "Russia provides free military aid to Central African Republic — Foreign Ministry". Russian News Agency TASS. 22 March 2018. "At the request of the Central African Republic’s president, Russia decided to provide the country with free military aid," he said. According to him, with the consent of the United Nations Security Council committee, the Russian Defense Ministry handed a batch of small arms and ammunition to the armed forces of the Central African Republic and sent five military and 170 civilian instructors to train the country’s military servicemen. ^ Hauer, Neil (27 August 2018). "Russia's Favorite Mercenaries". The Atlantic. Then, in March 2018, the Kremlin issued a statement that 170 “civilian advisors” (widely understood to mean Wagner forces) had arrived in the CAR to train government forces. At the end of July, another 500 alleged Wagner fighters appeared on the Sudan-CAR border. ^ "In diplomatic shift, Russia calls for Gadhafi to step down". CNN. 27 May 2011. Archived from the original on 23 July 2011. Retrieved 21 September 2011. ^ "Russian envoy visits Benghazi for Libya mediation". Reuters. 7 June 2011. Retrieved 21 September 2011. ^ "Libyan rebels ask Russia to open mission in Benghazi". RIA Novosti. 8 June 2011. Retrieved 21 September 2011. ^ Gutterman, Steve (1 September 2011). "Russia recognises Libya's Transitional Council". Reuters. Retrieved 21 September 2011. ^ "Transcript of Remarks and Response to Media Questions by Minister of Foreign Affairs of the Russian Federation Sergey Lavrov at Joint Press Conference Following Talks with Ojo Maduekwe, Minister of Foreign Affairs of Nigeria, Moscow, March 17, 2009" (Press release). Ministry of Foreign Affairs of Russia. 17 March 2009. Retrieved 18 March 2009. ^ "Посольство Мадагаскара в РФ - Обращение Посла МАДАГАСКАРА в РФ". Ambamadagascar.ru. Retrieved 26 August 2017. ^ "Главная - Министерство иностранных дел Российской Федерации". Madagasxar.mid.ru. Archived from the original on 30 April 2011. Retrieved 26 August 2017. ^ Ginsburgs, George; Slusser, Robert M. (1981). A calendar of Soviet treaties, 1958–1973. BRILL. p. 846. ISBN 90-286-0609-2. Retrieved 18 July 2009. ^ "Российско-маврикийские отношения". Russian Ministry of Foreign Affairs. 16 February 2009. Retrieved 20 July 2009. ^ "Russia to Develop Economic Cooperation with Mozambique". Archived from the original on 3 August 2007. ^ Ginsburgs, George (1987). "1976". A calendar of Soviet treaties, 1974-1980. BRILL. p. 163. ISBN 90-247-3628-5. Retrieved 27 May 2009. ^ Посольство в Виктории (in Russian). Ministry of Foreign Affairs of Russia. Retrieved 27 May 2009. ^ "Russian embassy in Pretoria". Russianembassy.org.za. Archived from the original on 21 March 2011. Retrieved 15 May 2011. ^ Россия, США и Китай признали Республику Южный Судан (in Russian). Rossiyskaya Gazeta. 9 July 2011. ^ "Russia establishes diplomatic relations with South Sudan - People's Daily Online". English.peopledaily.com.cn. 25 August 2011. Retrieved 19 March 2012. ^ "Embassy of Tanzania in Moscow". Archived from the original on 28 May 2009. Retrieved 23 July 2009. ^ "Russian embassy in Buenos Aires". Archived from the original on 7 July 2009. Retrieved 7 March 2018. ^ "Экономика Барбадоса". Polpred.com. Retrieved 26 August 2018. ^ "Russia willing to assist Caribbean with oil and gas exploration". Archived from the original on 15 March 2018. Retrieved 2 December 2018. ^ "Russia to aid Bolivia drugs fight". BBC News. 17 February 2009. Retrieved 2 May 2010. ^ "Dominica and Russia celebrate 20 years of diplomatic relations". dominicanewsonline.com. ^ "Russian embassy in Quito". Archived from the original on 20 September 2008. Retrieved 7 March 2018. ^ David Ryan (2000). US foreign policy in world history. Routledge. p. 172ff. ISBN 0-415-12345-3. ^ Cite error: The named reference date was invoked but never defined (see the help page). ^ "Embassy of Russia in Panama City (in Russian and Spanish)". Archived from the original on 24 June 2009. Retrieved 19 June 2009. ^ "Paraguayan embassy in Moscow". Embapar.ru. Retrieved 22 June 2012. ^ "Russia declares its intention to open a resident embassy in Asuncion". En.rian.ru. 13 September 2007. Retrieved 22 June 2012. ^ "Embassy of the Russian Federation in Georgetown about relations with Trinidad and Tobago". Archived from the original on 23 February 2012. Retrieved 31 July 2010. ^ "Embassy of the Russian Federation in Montevideo". Archived from the original on 16 July 2009. Retrieved 7 March 2018. ^ "Посол Российской Федерации в Азербайджанской Республике » Посольство Российской Федерации в Азербайджанской Республике". Retrieved 20 February 2015. ^ "Political Relations / Embassy of the Russian Federation in the Kingdom of Cambodia". Archived from the original on 19 October 2009. Retrieved 2 January 2019. ^ "Relations between Georgia and Russia". Ministry of Foreign Affairs (Georgia). Archived from the original on 16 July 2011. Retrieved 11 July 2011. ^ VOA News Report. Globalsecurity.org (19 January 2004). Retrieved 12 November 2011. ^ "Embassy of Russia in Amman". Archived from the original on 13 April 2009. Retrieved 7 March 2018. ^ Zabortseva, Yelena Nikolayevna (2016). "Russia's Relations with Kazakhstan: Rethinking Ex-Soviet Transitions in the Emerging World System". London-New York: Routledge. ISBN 978-1-315-66872-7. ^ Martha Brill Olcott. "Russia". Kyrgyzstan: a country study (Glenn E. Curtis, editor). Library of Congress Federal Research Division (March 1996). This article incorporates text from this source, which is in the public domain. ^ "Главная - Министерство иностранных дел Российской Федерации". Archived from the original on 21 February 2015. Retrieved 21 February 2015. ^ "Russian-Malaysian Relations". Embassy of the Russian Federation in Malaysia. Retrieved 29 December 2017. ^ Малайзия (in Russian). Ministry of Foreign Affairs of Russia. Archived from the original on 14 June 2011. Retrieved 16 May 2008. ^ "Welcome to the Official Website of Embassy of Malaysia, Moscow". Ministry of Foreign Affairs of Malaysia. Archived from the original on 7 February 2009. Retrieved 16 May 2008. ^ Cite error: The named reference mfat was invoked but never defined (see the help page). ^ "Chinese dilemma over Burma". BBC News. 25 September 2007. Retrieved 30 May 2008. ^ "Russia, China veto resolution criticizing Burma". The Washington Post. 13 January 2007. Retrieved 30 May 2008. ^ "US criticizes Russia for arming Myanmar amid Rohingya crisis". Fox News. 24 January 2018. Retrieved 2 January 2019. ^ "Speech of H.E. Mr. Sergey Peskov, Ambassador Extraordinary and Plenipotentiary of the Russian Federation, to the Islamic Republic of Pakistan, at the Jubilee Function on the occasion of celebration of the 60th anniversary of the establishment of diplomatic relations between Russia and Pakistan". Pakistan.mid.ru. Archived from the original on 2 April 2012. Retrieved 24 November 2012. ^ Paul Alster (22 December 2012). "Russians moving into Syria. Strategic alliance include fleet, missiles". Fox News. Retrieved 10 March 2013. ^ "炮擊金門幕後揭秘：玩弄中蘇同盟種下分裂惡果-歷史名人-文化名城-廣佛都市網". Big5.citygf.com. 25 June 2010. Archived from the original on 13 March 2013. Retrieved 25 April 2013. ^ "Representative office in Taipei for the Moscow-Taipei Coordination Commission on Economic and Cultural Cooperation v.2.0". Mtc.org.tw. Retrieved 25 April 2013. ^ "Chinese Taipei, Russia Intensify Cooperation". Taiwan.gov.tw. Archived from the original on 3 December 2013. Retrieved 15 November 2013. ^ "Russians Continue to Guard the Tajik Border with Afghanistan". The Gazette of Central Asia. Satrapia. 21 September 2012. ^ Associated Press (4 July 2008). "Russian president in Turkmenistan to consolidate Kremlin's grip on Central Asian energy". International Herald Tribune. Retrieved 5 July 2008. ^ Blagov, Sergei (30 December 2008). "Russia faces a collapse of its economic and political clout". Eurasianet. Archived from the original on 12 February 2010. Retrieved 16 April 2008. ^ Trilling, David (15 April 2009). "Pipeline spat with the Kremlin turns into a political test of strength". Eurasianet. Archived from the original on 18 April 2009. Retrieved 16 April 2008. ^ Blank, Stephen (2 July 2008). "Russian president strives for a breakthrough moment in Caspian basin energy game". Eurasianet. Archived from the original on 12 August 2008. Retrieved 5 July 2008. ^ "Vietnam-Russia traditional ties reach new heights". Embassy of Vietnam in the United States of America. 5 March 2001. Retrieved 8 August 2007. ^ "Defense.gov News Article: Russian Troops Arriving in Bosnia". Defense.gov. Retrieved 20 February 2015. ^ "Russian embassy in Sofia". Archived from the original on 16 March 2009. Retrieved 7 March 2018. ^ "Russian-Danish Diplomatic Relations". Russian embassy in Copenhagen. Archived from the original on 30 July 2012. Retrieved 13 March 2011. ^ Government of Russia. "Russian embassy in Copenhagen, Denmark". Archived from the original on 2 August 2012. Retrieved 22 February 2011. ^ Cite error: The named reference Russia was invoked but never defined (see the help page). ^ "Danish consulate general in Saint Petersburg, Russia". Archived from the original on 26 October 2011. Retrieved 20 October 2011. ^ "Katso kartta: venäläisten maakauppoja strategisissa kohteissa". Iltalehti.fi. Retrieved 24 December 2017. ^ "Supo epäilee: Venäjä ostanut Suomesta kiinteistöjä sotilailleen". Iltalehti.fi. Retrieved 24 December 2017. ^ "Ulkoasiainministeriö: Maat ja alueet: Kahdenväliset suhteet". Archived from the original on 25 November 2008. Retrieved 2 January 2019. ^ "English > Russia > The Icelandic Foreign Services". Archived from the original on 29 March 2015. Retrieved 20 February 2015. ^ "Norway – the official site in Russia". Retrieved 20 February 2015. ^ "Homepage – Australian Embassy". embassy.gov.au. ^ "Посольство России в Австралии". Australia.mid.ru. Archived from the original on 16 January 2016. Retrieved 22 October 2016. ^ Harding, Luke (14 December 2009). "Tiny Nauru struts world stage by recognising breakaway republics". London: The Guardian. Retrieved 14 December 2009. ^ HUFFER, Elise 1993, pp.272-282"
^ "Opinion of Russia - Indicators Database | Pew Research Center". Pewglobal.org. Retrieved 11 June 2017. ^ Cartalucci, Tony. "The Myth of Russian Aggression". New Eastern Outlook. Retrieved 3 August 2014. ^ Ragsdale, H. (1988). Evaluating the Traditions of Russian Aggression: Catherine II and the Greek Project. The Slavonic and East European Review, 66(1), 91-117. ^ a b Geers, Kenneth, ed. Cyber war in perspective: Russian aggression against Ukraine. CCDCOE, NATO Cooperative Cyber Defence Centre of Excellence, 2015. ^ Mearsheimer, John J. "Why the Ukraine crisis is the West's fault: the liberal delusions that provoked Putin." Foreign Affairs 93 (2014): 77. ^ Berlin Information-centre for Transatlantic Security; British American Security Information Council; Centre for European Security and Disarmament; Centro de Investigación para la Paz (4 July 1997). "The NATO-Russia "Founding Act": Stepping Stone or Stumbling Block for a European Security Architecture?" (Summit briefing). Berlin Information-centre for Transatlantic Security. Retrieved 23 August 2008. ^ See Vladimir Socor, "Kremlin Refining Policy in 'Post-Soviet Space'," Eurasia Daily Monitor (7 February 2005). ^ Lowell W. Barrington, Erik S. Herron, and Brian D. Silver, "The Motherland Is Calling: Views of Homeland among Russians in the Near Abroad," World Politics 55, No. 2 (2003) : 290–313. ^ "Latvia agrees to end border dispute with Russia — RT World News". Rt.com. 8 February 2007. Retrieved 26 August 2018. ^ Business Standard. "India News, Latest News Headlines, Financial News, Business News & Market Analysis on Indian Economy - Business Standard News". ^ "The Sino-Russian border: The cockerel’s cropped crest - The Economist". The Economist. 26 July 2008. ^ a b Gutterman, Steve (18 March 2014). "Putin signs Crimea treaty, will not seize other Ukraine regions". Reuters.com. Retrieved 26 March 2014. ^ a b "Ukraine crisis: Timeline". BBC News. 13 November 2014. Ambrosio, Thomas (2005). Challenging America's Global Preeminence: Russia's Quest for Multipolarity. Routledge. ISBN 0-7546-4289-5. Ambrosio, Thomas, and Geoffrey Vandrovec. "Mapping the Geopolitics of the Russian Federation: The Federal Assembly Addresses of Putin and Medvedev." Geopolitics (2013) 18#2 pp 435–466. Bowen, Andrew (2017). "Coercive Diplomacy and the Donbas: Explaining Russian Strategy in Eastern Ukraine". Journal of Strategic Studies. doi:10.1080/01402390.2017.1413550. Dall'Agnol, A. C.; Zabolotsky, B. P.; Mielnieczuk, F. "The Return of the Bear? Russian Military Engagement in Latin America: The Case of Brazil". Military Review (2018). Larson, Deborah Welch, and Alexei Shevchenko. "Status seekers: Chinese and Russian responses to US primacy." International Security (2010) 34#4 pp 63–95. Menkiszak, Marek: "Responsibility to protect... itself? Russia’s strategy towards the crisis in Syria", FIIA Briefing Paper 131, The Finnish Institute of International Affairs. Tsygankov, Andrei P. "The Russia-NATO mistrust: Ethnophobia and the double expansion to contain "the Russian Bear"." Communist and Post-Communist Studies (2013). Wikimedia Commons has media related to International relations of Russia. Containing Russia: Back to the Future?, July 2007 article by Russian Minister of Foreign Affairs Sergey Lavrov.